... the biggest risk overhang remains the escalating trade war with China, and specifically Beijing's retaliation to the unexpected Trump escalation in which he told the USTR to consider an additional $100BN in tariffs for a $150BN total. As previously discussed, one potential complication in the Chinese retaliation is that the US does not have $150BN in exports to China, which means that Beijing will need to get creative in crafting its escalating response. Blocking rare-earth exports. China has a near global monopoly on the production of rare earths, which are a critical component in all high-tech devices such as cell phones, computers, fighter jets and cruise missiles. In national defense, there is no substitute and no other supply source available. 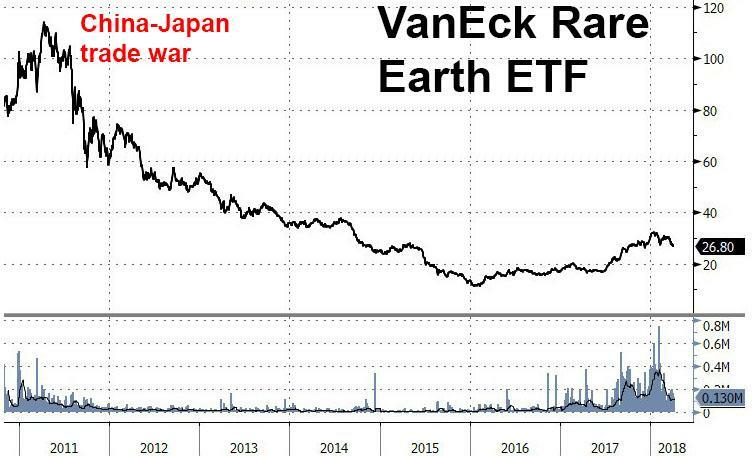 When China blocked rare earth exports to Japan over a territorial spat involving the East China Sea in 2011/2012, the price of rare earths soared. However, as pointed out previously, any escalation involving one or more of these countermeasures would assure an even more aggressive response by the US, which as we reported last week has deployed three carrier battle groups to the South China Sea, in a less than subtle message to Beijing. Putting all of the above together, China watchers, traders, pundits, politicians and virtually everyone else wants to know just one thing: what will China do? 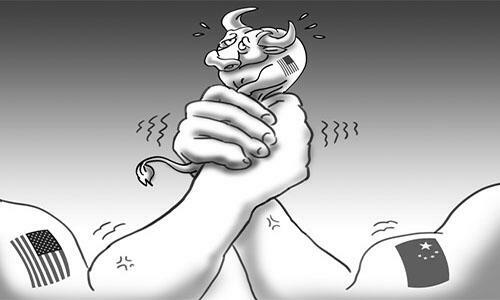 Conveniently, on Sunday China's state-owned Global Times newspaper, the tabloid where all nationalistic propaganda for mass popular consumption is printed, writes that Chinese authorities have "ample weapons to prevail if the US escalates trade war", explaining Beijing's strategy as follows: "the Chinese authorities will take all necessary measures to minimize the losses for Chinese companies and individuals. Nonetheless, the US, the world's largest economy with a GDP of approximately $19 trillion, has less endurance for a full-blown trade war." Echoing the Chinese ministry of commerce, the article notes that while China does not want a trade war with the US, which is one of its most important trade partners, "if US President Donald Trump starts a trade war, China will fight to the end to defend its interests." In an all-out trade war, offense and defense are equally important to winning. The Trump administration said it will impose punitive tariffs on Chinese imports ranging from industrial robots and electric vehicles to locomotives and jet engines. If this measure is carried out, China can provide export-promoting subsidies for companies that export goods on the list. Author Hu Weijia also claims that behind the trade dispute is the US concern over the "Made in China 2025" program, which aims to upgrade China into a manufacturing superpower. However, he claims, Trump's efforts will be in vain as "the Chinese government is highly able to mobilize resources and coordinate action to promote its strategy and protect domestic employment." In this context, export-promoting subsidies are just one of several options for China "to use in tackling a trade dispute with the US" according to the Global Times. China also suggests that the asymmetric distribution of gains vs losses in the US, will make it easy for Beijing to win a trade war. In the US, some interest groups such as steel companies benefit far more than others from trade protectionism, while the trade disputes potentially hurt exports of US farm products. 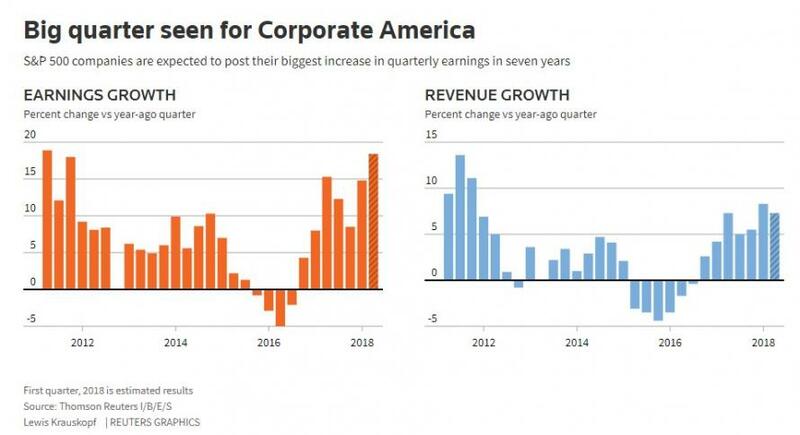 However the most notable suggestion in the Chinese propaganda outlet, is that the US stock market us the most important pain-transmission mechanism, something Trump himself appears to have realized with his Friday warning to investors to prepare for "pain" in the market. Here's how China sees its leverage, which can be simplified with the following: S&P500. US stocks saw deep losses in recent days amid jitters about Sino-US trade tensions. While it is hard to win a trade war with punitive tariffs, it is more difficult to protect people from feeling pain in the fight. In other words, instead of the Bernanke, or the Yellen, or the Powell put, traders now have something new to worry about: the Chinese call. Because of an uneven distribution of interests, US society is likely to be more and more split in its attitude to the trade war with China, making the trade war very costly for Trump. China is probably right, the only question is how much pressure - in the form of S&P downside pain - can Trump withstand before he backs off. We may find out this week.